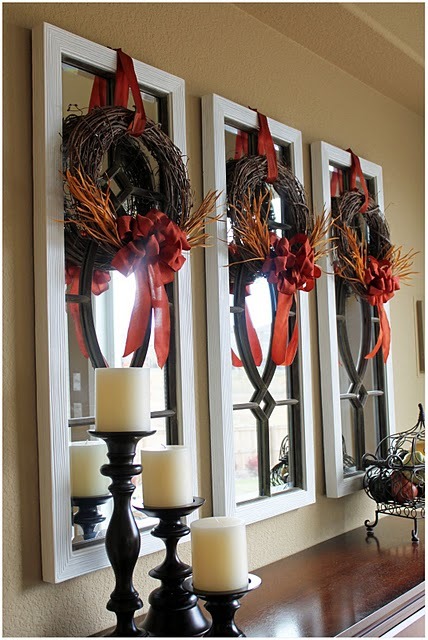 I love these gorgeous Fall wreaths that Trisha made for her entry. All of the supplies were purchased for under $20 (for all three) and if you happen to have some of it on hand (or only need one wreath) it would be even less expensive to make. My favorite part of the wreath are the gorgeous orange bows. Save On Crafts has great bow tying tutorials and Trisha used the graduated loopy bow. You can learn how to tie one HERE. Where are your mirrors from? I love those! !